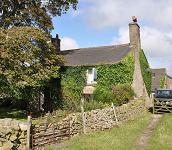 This self catering holiday cottage and B&B is part of a working farm. Newly built in the new century in traditional style with stone walls and stone roof tiles, this premises must have one of the finest views even in this beautiful area, in the Peak District National Park, looking out over the upper Dean valley and Lamaload reservoir. In fact, from around the buildings there are wonderful views across the Cheshire plain as far as the Welsh mountains on a fair day. This is an excellent example of farming diversification, a wonderful location for enjoying the countryside from the farming perspective. While I enjoyed the views the sheep were being given their annual dipping across the yard! They also have another fully modernised holiday cottage about a mile from the farm. This, too, is on high ground and enjoys stunning views across the valleys to the hills beyond. Ideal for a walking holiday. Their web site is called cottages-with-a-view; that says it all! Finding it: In the hills above Rainow; up Ingersley Road from Bollington, continue for 2 miles, right at the T junction, 2nd left up Smith Lane. From Rainow, about a half mile along the Whaley Bridge road from the village, turn right up Smith Lane, it’s well signed on the right just over a quarter mile then all the way down the long drive.